The backyard poultry market is growing rapidly but many novice poultry owners are unaware of simple preventative health routines that can significantly improve the health and wellbeing of their birds. Worms are not always visible and infection can be asymptomatic but worms can also affect egg quality and yield – fewer, smaller, paler, brittle eggs can result. Affected poultry can suffer ill thrift, anaemia and even death. The non-specific nature of the condition can make it hard for novices to identify. Embryonated worm eggs resist disinfectants and can survive for years. Fomite transmission: footwear, equipment or other animals. Free range and deep litter husbandry systems increase exposure to parasitic worms and may favour worm egg survival. 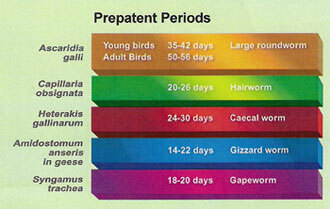 Active infections of the common worms affecting poultry: Ascaridia (roundworms), Capilliaria (hairworms), Syngamus trachea (gapeworm), Heterakis (small roundworms) and Amidostomum anseris (gizzard worm) in geese need to be controlled through effective preventative and strategic de-worming programmes. 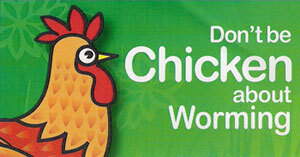 There is more information here on our page about worming poultry. Random worming may not be effective because worm eggs in the environment are a source of ongoing infection for a number of years. Once infection pressure is reduced, regular treatment will help keep the level of adult egg laying worms in the birds to a minimum. Made from a licensed formulation specifically for the smaller poultry flock. Can be supplied through oral prescription by a vet, pharmacist or SQP. 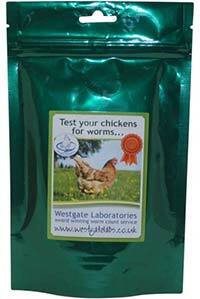 Available in a 60 g pack which can treat around 20 birds for 7 day treatment period. Simple dosing using supplied scoop – just one 6g scoop treats 2 kg of food for chickens or geese, one 6 g scoop treats 3 kg of food for turkeys. Kills all stages of common poultry worms. Birds must not be slaughtered for human consumption during treatment. Treated birds may be slaughtered for human consumption only after 7 days from the last treatment; the meat withdrawal time is 7 days. There is no withholding period for chickens producing eggs for human consumption when the product is used at the recommended inclusion rate; the egg withdrawal time is zero days. For Animal Treatment Only. To be supplied only on veterinary prescription – from your veterinarian, pharmacist or a suitably qualified person. Keep out of the reach of children. Store in tightly closed, original container below 25°C. The product is a powder and mixing may generate dust. Prepare the product in a well ventilated place. If accidental inhalation of dust occurs, move to an outdoor area with fresh air. Accidental ingestion by humans should be avoided. Avoid direct skin contact. Wear impervious gloves when mixing and handling the product. Wash affected parts if skin contact occurs. If accidental eye contact occurs, immediately rinse thoroughly with water. Dispose of empty containers in the domestic refuse. Used containers should not be recycled.